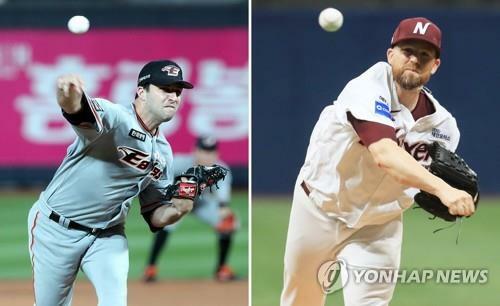 DAEJEON, Oct. 18 (Yonhap) — The first round of the Korea Baseball Organization (KBO) postseason will open with two American starters toeing the rubber. The Hanwha Eagles will host the Nexen Heroes at 6:30 p.m. Friday at Hanwha Life Eagles Park in Daejeon, 160 kilometers south of Seoul. And to start the best-of-five series, both clubs will send import hurlers who arrived as midseason acquisitions. Right-hander David Hale will take the mound for the Eagles. He went 3-4 with a 4.34 ERA in 12 starts after replacing Jason Wheeler in July. He didn’t face the Heroes during the regular season. KBO teams can each carry a maximum two foreign pitchers. Kevyus Sampson is the other import pitcher for the Eagles, but he had an 11.12 ERA with two losses against the Heroes during the regular season. Hanwha manager Han Yong-duk said he chose Hale because he pitched well down the stretch. Hale throws four-seam and two-seam fastballs, while also mixing in a changeup and slider. The Heroes will counter with right-hander Eric Hacker. He was 5-3 with a 5.20 ERA in 14 starts. Hacker spent five previous seasons with another KBO club, the NC Dinos, but wasn’t re-signed after last season. He joined the Heroes after Esmil Rogers left the club with an injury. Hacker pitched in nine postseason games for the Dinos from 2014 to 2017. He faced the Eagles once during the regular season, and gave up three runs — one unearned — on seven hits in six innings for a win. Hacker has a bigger arsenal of pitches — a four-seamer, two-seamer, changeup, curve, cutter and slider. Nexen skipper Jang Jung-suk said Hacker brings big game experience to the table. In the past 11 first-round series that took the best-of-five format, teams that won Game 1 advanced to the next round seven times.